The nights are getting dark and the weather is turning colder – but did you know that having a wedding in the winter can actually be one of the most magical times of year! For a start you could opt for a Christmas theme – because who doesn’t love Christmas! Secondly if the weather is on your side you may be in for a truly white wedding with snow – and how gorgeous would that look on the photos! If you are having a winter wedding, there are some extra considerations with regards to your hair and makeup. So here is our ultimate guide to wedding hair and makeup for a winter wedding! Fresh flowers can be the perfect romantic finish to your wedding hairstyle – but you’ll have to make sure the blooms you have chosen can withstand the colder temperatures that winter brings. Snowdrops are a good choice or hardy greens such as ivy for a truly festive look. Alternatively, go for sparkle with a tiara or crystal slide for extra loveliness. 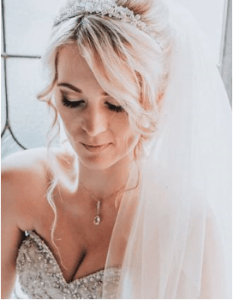 Many brides think summer is the worst season for hair – with all that extra heat and humidity causing no end of flyaways and potential frizz – but in actual fact, the cold winter air can cause your hair to become dry and look a little dull. You can ensure your hair is super glossy and gorgeous for your big day by deep conditioning it with hair masks in the two weeks leading up to the big day. 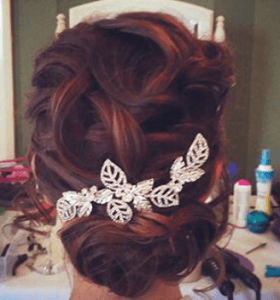 With the potential for rain, snow or sleet – or even wind messing up your do, we recommend opting for an updo on your wedding day. This will ensure your hair looks in tip top condition and the style will stay put all day. 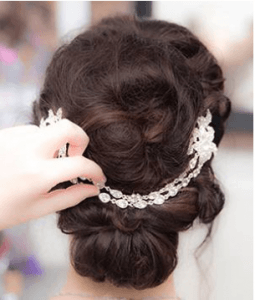 Chignons are a popular choice for bridal hair, while rolled updos, French braids, plaits and twists all look stunning – plus they have the added bonus of keeping your hair off your face. Remember to drink plenty of water in the months leading up to your wedding to make sure your skin is thoroughly hydrated. Mild exfoliation once a week will get rid of any dry, dead skin cells, while a rich moisturiser will keep it soft and smooth. While a little colour in your cheeks looks oh so romantic on your wedding photos, you don’t want bright red cheeks – which is an unfortunate effect of the winter air. Choose a foundation with full coverage to avoid this problem. Your makeup artist can help advise which is best for your skin type during your bridal makeup trial! A simple pop of colour (such as a plum or red lip) will offset paler skin beautifully for a winter wedding – not to mention make those wedding photos look stunning! Stronger colours tend to last longer as well, which is an added bonus. Afraid of bold colour? A smoky eye can look just as effective. Waterproof formulas are best for the winter climate to avoid making you look teary eyed or smudging your makeup. We will go through all of our products with you during your trial and adjust them on the day if necessary to adapt to the weather. Now all that’s left to do is get your dress on and enjoy the best day of your life! Not booked your hair and makeup trial yet? Contact us today to find out prices and availability for your wedding day.